And you can join us too! Tickets are now on sale for our Midsummer production where we will take you on a small walk around Hinchingbrooke Park as we follow Frodo on his quest to destroy the One Ring. Tickets are available both here and over on Facebook right now. Watch this space for where to get your paper tickets soon! We are delighted to announce that we are going to be a part of the National Theatres “Connections 500” to celebrate the 21st birthday of the Connections program. Every year the National Theatre invite a number of youth theatre groups across the country to perform a specially commissioned play written to inspire and challenge young performers. Back in 2011 we performed Dirty, Dirty Princess a play that had been written for Connections and so we’re enjoying going through the scripts of potential productions ready to make our selection for our first show in 2016. In September we’ll be confirming the play we’ll be performing and work will begin with our leaders being given the opportunity to attend directors workshops with the writer and team at the National Theatre. It is a great opportunity for our young members to be involved in such a prestigious endeavour and we can’t wait to share more information with you as the project develops. 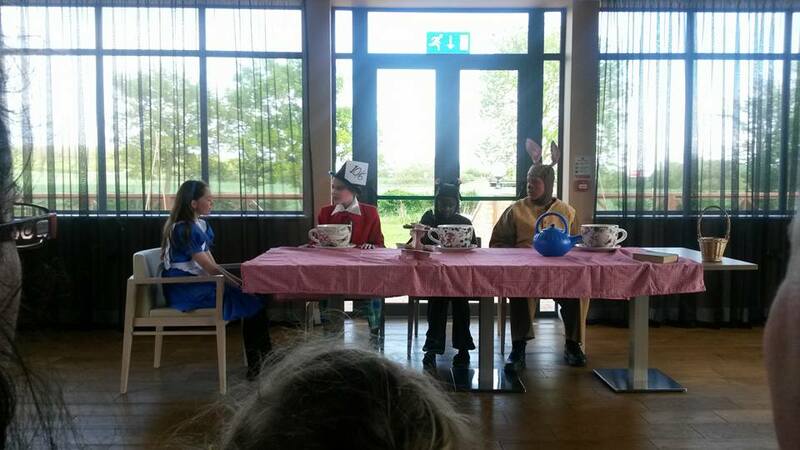 With our performance of “The Mad Hatters Tea Party” at the Holiday Inn now been and gone we are preparing for the run towards our Summer holiday. Rehearsals are ongoing of an episode of Fawlty Towers and Graeme Hammond is putting together a piece of workshop theatre and they will be performed in-house before we break up. Following that we’ll be holding workshops and auditions ahead of our winter production “Dracula” which will be directed by Ray Livermore and to performed in December. 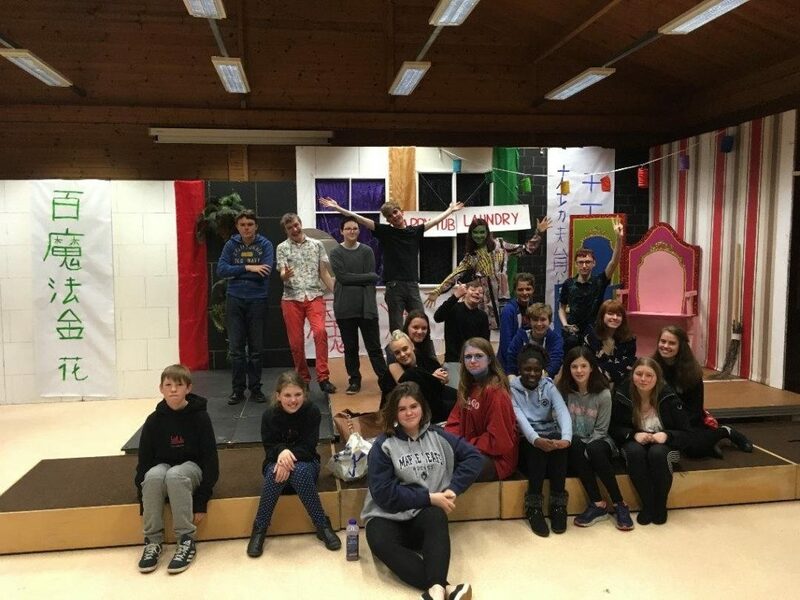 So between rehearsals for those, audition preparation and our group trips to see Shakespeare at the George and their production of “The Merry Wives of Windsor” and Tolethorpe for “Romeo and Juliet” we’ve got a busy few weeks ahead! As we’re coming to the end of the year and heading in to a Summer break before coming back for “Sleeping Beauty” as our big winter production we’re going to be putting on our end of term free showcase. 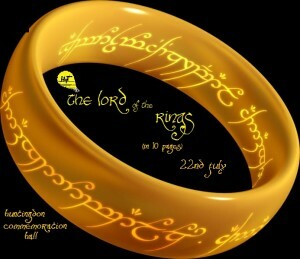 This year it will be our very own version of Lord of the Rings, a somewhat shorter the Tolkien classic as the script comes in at just 10 pages! Come along on the 22nd of July at 7:30 to the Commemoration Hall in Huntingdon for this free piece of theatre! Joshua Slade on the radio! We are putting together the finishing touches from the Trial of Joshua Slade and this will be broadcast next Monday, the 26th May on Huntingdon Community Radio at 7 o’clock. This is a great opportunity for those who were unable to fit into the crowded court room on the day to hear what happened in our town nearly 200 years ago! It can be heard locally by tuning in to 104fm or online over at the HCR website. Here is the trailer the radio station prepared advertising it!